Antonis Vradis from the Occupied London collective looks at the role of the central Athens district of Exarcheia in Greek politics and counter-culture. A very unusual thing happened on February 12th in Athens: the Greek capital city went up in flames. Now, even the casual follower of events in the country might spot something peculiar in this sentence — not with the event described, but with the statement. Is that any news? Haven’t smoke and flames risen enough times to question that “Athens is burning” is really that unusual? For the casual follower of Greek events the array of images of destruction have become a series of near-unimportant blips. Ever so often, “Athens is burning”. Somewhere. But on that night, Athens was burning. Everywhere. And yet, in the years that preceded the arrival of the IMF/EU/ECB troika in the country, throughout the entire so-called Greek Metapolitefsi (the post-dictatorial era1), Athens wasn’t burning just anywhere — let alone, of course, everywhere. Quite to the contrary. The city saw prolonged periods (spanning over at least three decades) of remarkable concentration of its world-renown skirmishes between youth and police. These would often culminate in larger-scale unrest; riots or urban revolts — but one thing would almost never change: nearly without exception, every single one of such instances in Greece’s post-dictatorial era took place in the central Athens neighbourhood of Exarcheia. This commentary attempts to explain how this concentration of collective violence emerged and how this “violence equilibrium” that it created was interlaced with the post-dictatorial regime as a whole. It explains the importance of the revolt of December 2008 as a liminal event2 — one that was sparked within Exarcheia but quickly exceeded its confines. Both a predecessor and an opening act to the current economic crisis, December’s revolt gave way to a period of violence that was diffused across much of the Athenian entity — so far culminating with the widespread violence of February 12th. The events of that night illuminated an already simmering diffusion of violence, a long-time-coming termination of the “spatial contract”: this implicit yet rigid agreement upon which a certain level of social upheaval and unrest had become possible within the limits of Exarcheia, under a mutual but muted understanding that such unrest would rarely, if at all, spill over to other parts of the city. Exarcheia, this small central Athenian neighbourhood, is surrounded by universities and much influenced by them: in both ways, it is defined by their presence. The Law School of Athens University is adjacent to it and the old Chemistry School building is here, too. But the campus that has single-handedly marked the neighbourhood belongs to the National Technical University (NTUA, or Athens Polytechnic: the Polytechneio). It was right here, on the night of November 17th, 1973, that an anti-dictatorial university student uprising would be quelled by forces of the military junta (1967-1974) soon before the regime would reach its own end. The struggle of the students inside the Polytechneio became a symbol of resistance against the old regime. By extension, to be part of the Polytechneio generation became a source of legitimisation within the post-dictatorial regime and by double extension, a source of legitimisation for the regime as a whole. In the post-dictatorial state the anniversary of the uprising became a school-celebrated National Day. The etymology of the word Exarcheia could plausibly be of [ex] (beyond) + [archė] (authority). Never let the facts get in the way of a great etymological definition!3 Had this been true, it would quite literally denote Exarcheia as a space of exception — which it is, nevertheless. The crucial differentiation of the neighbourhood is that instead of “confirming the rule” (as in the classic definition of Schmitt, 1985, also used in Agamben, 2005), Exarcheia defies the rule and by doing so, it legitimises it. Paradoxical? The short answer is, quite! A more complete answer requires delving into this exact paradox. When accepting the power transfer from the Junta Generals in 1974, the Democratic authorities must have been fully aware of how different their regime would be from its counterparts flourishing in the European core. To begin with it, was evidently poorer. A state that was therefore for its largest part unprepared and unable to enter into a widespread social contract, this implicit agreement guaranteeing the continuity of a regime and the simultaneous social reproduction of its subjects. Consent would not have been reached through welfare; the state was not rich enough to achieve this. And yet, there is one thing this part of the world has always been rich in, and that is the vivid spatial articulation of its politics. The Antartes (Partisans) resisting the Axis Occupation (1941-1944) and fighting the succeeding Civil War (lasting until 1949) βγήκαν στο βουνό (“went out to the mountain”) as the saying would have it, to join the struggle4. The punishment of the dissidents of the Junta was also an inherently spatial one. Those fighting the regime — or suspected of doing so — would find themselves outside the limits (in exile, εξ’ορία — lit. “beyond limits”) of society yet clearly at the very centre of the regime’s jurisdiction, its zone of control. Both these events stemmed from actions that were far from voluntary. The Partisans were forced to take to the mountains; the dissidents of the dictatorial regime had the decision of exile made for them. But in the case of the democratic regime succeeding the Junta, the decision to place oneself in the ex-oria of Ex-archeia was largely voluntary and reciprocal: those finding themselves at the margins of Democracy used Exarcheia to ground their marginality. At the same time the democratic regime allowed Exarcheia to become this site of antagonism, of distancing from its rule, an inverted space of exception. Why? Why would sovereignty, however implicitly or partially, lift its rule from any segment of its territory? There has recently been a growing discussion on a disjuncture (or, in any case, a rearticulation of the relationship) between territory and sovereignty. Agnew (2009) shows how the process of globalisation acts independently from state sovereignty, further complicating (rather than weakening) its relationship to territory. Elden (2009) explains how the relationship between the two is reconfigured, particularly in face of the ‘war on terror’. But the case of Exarcheia might be pointing at another way in which this disjuncture is articulated: as a space of exception, of exceptional unrest, Exarcheia outlines the limits of the Democratic regime, therefore proving it does, indeed, have a limit. Gone were the days of the dictatorship, this totalitarian regime, the days of the total. The new regime knew how to show restraint and Exarcheia was its tangible proof. And further: for the democratic regime, the tolerance of Exarcheia and the subsequent growth of a movement of resistance there symbolically allowed it to claim a continuity with the dissidents of the dictatorship. By extension, the widespread social legitimisation of post-dictatorial Greek democracy was built on this exact claim of continuity with the anti-dictatorial struggle. This is key, not least because the transition from dictatorship to democracy was exactly so: a transition — more of the old regime handing over power, less of the new one laying claim upon and affirming it through any kind of rupture. Yet still, a line of continuity in social imaginary traced democracy to the dissidents of the Junta. Thanks to the exceptional site of Exarcheia, it became possible for the continuities between the dictatorial and democratic regime to appear closer to schisms. The need for a regime to distinguish itself from its predecessor goes a long way back, it would seem. There is a classic example (no pun intended, eve if it is from classical Greece) where regime rupture was articulated, once again, through a difference in the spatial exclusion of dissidents. For Sara Forsdyke, ostracism (a temporary, democratically decided exile of an individual in archaic Athens) was “more than ‘a democratic form of an elite practice’”; it was precisely an attempt by Athenians to distinguish “democratic rule from the forms of elite rule that had preceded it” (2005: 2). This slightly older Athenian example once again concerns the spatial exclusion of dissidents and the demarcation of continuity between regimes through it. The similarity is remarkable. The politics of exile (permanent; mass; undemocratic) versus ostracism (temporary; individual; democratic) in archaic Greece. The politics of no exception (totalitarianism) of an undemocratic regime versus the politics of exception (in the sense that they allow, that is, for exceptions) of democracy. Here lies the essence of the spatial contract. It goes far beyond an exceptional site: it encompasses sovereignty, its subjects and the way in which they articulate and regulate their relationship in public urban space. This, in turn, spans beyond the question of coexistence. Providing and allowing for a spatial articulation of dissent, in the case of Exarcheia, replaced and discounted for an inability to reach social consent through welfare. Put simply, a social contract was unattainable and the spatial contract came to the rescue. Just like the social contract this contract, too, was unwritten. And just the same, it was — ostensibly — reciprocal but largely uneven. Although it was centred around Exarcheia it concerned a “violence equilibrium” that spanned (precisely through the neighbourhood’s unrest concentration) across the entire country. A turbulent Exarcheia translated into a largely peaceful Greece. And what an achievement this was, with much of the country’s turbulent immediate past being subdued. In the morning of May 6th, 2010 Greece made global headlines, once again. For the first time ever, a Eurozone member-country turned to international funding bodies5 for a financial loan6 in face of the severe effect of the global financial crisis upon its national economy. Not too long ago, the country had once again been in the global spotlight (a never-ending occurrence, it seems). The revolt of December 2008 was sparked by the shooting of a 15-year old boy, Alexandros Grigoropoulos, by police in the heart of Exarcheia. How could the country’s two moments of fame relate to one another? Some were quick to brand the unprecedented urban revolt that followed the shooting of Grigoropoulos as the first revolt of the global financial crisis. Was it so? December was a liminal event and — as with all liminal events — it is difficult to trace whether it marked a beginning or an end. With its spread across Athens first, then Greece and partially even further beyond, the 2008 uprising may have been a prelude to the mass, widespread unrest that succeeded it, marked and amplified by the arrival of the troika in the country. This is most certainly plausible. But before it turned itself into this prelude, December caused a severe disruption to the existing violence equilibrium: the spatial contract was seriously put into question. The question of territoriality of unrest is important. The “spatial contract”, or the “violence equilibrium” does not denote a mere clustering of unrest. It is not simply about pinning riots close to one another in a map; far from so. The territoriality of unrest defines its social qualities and political value. Proof? For one, throughout Greece’s post-dictatorial era, the violence equilibrium did not just see a concentration of violence in Exarcheia. It saw a level and type of violence that was both conceivable and manageable by the regime it was faced against: commemorative riots essentially acted — for many — as a rite of passage, as an introduction to a turbulent national political life. The actors of the riot, and this is related, were predominantly homogeneous in their composition. Think young, male, white, and Greek; just like Grigoropoulos in 2008. Until the split-second of his shooting the event fit perfectly into the existing violence equilibrium. But from the very next split second, it exceeded and unbalanced it. This is precisely how it was liminal. It exceeded the violence equilibrium not only by breaking through the confines of the neighbourhood; it was also a liminality inscribed in the actors of the revolt, unprecedented as they were in the mixture of their social and class composition: migrants and school children, activists and sports hooligans, usual and very, very unusual suspects. Fast forward now to the events of the night of February 12th. International news cameras rolled, as building after building was engulfed in fire. For the distant observer, the spectacle may have been hardly captivating; perhaps it would even bring some yawning. But what happened on that night was not just unusual. It was — literally — ground-breaking, shaking the foundation of the spatial articulation in dissent in Greece; terminating its spatial contract. The actors in the freshest of urban revolts, too, have gone long past the liminalities of December 2008. School children, migrants, anarchists and Leftists (in short, the usual suspects) found themselves lost in a sea of newcomers to the streets. With the spatial contract out-of-the-way, the new questions ahead are not merely about where but who and for what reason. With neo-Nazi supporters of the Golden Dawn affirming their presence in the streets (instances of racially-motivated violence are daily). 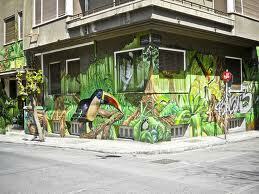 A “city-jungle” as per Filippidis (2011), where “war reigns and the social contract is buried”. Consent is buried and antagonisms beam naked in the urban terrain. An end of an era, an opening of another one. As always, history is unwritten and what happens next is quite impossible to predict. Yet in whatever follows, spatially demarcated antagonisms and consensual politics are bound to be absent. All options are fully, truly and wide open. My warmest thanks to Dimitris Dalakoglou, Klara Jaya Brekke, Andreas Chatzidakis and Hara Kouki for their feedback and comments on the original text. 1. Metapolitefsi literally denotes the post-[dictatorial] regime; yet the term has been used colloquially to denote the Third Greek Democracy (1974-present) in its entirety. 2. Liminality, from the Latin word limen, threshold — see Stavrides, 2010. For a rich discussion on the relationship between the anthropological rite of passage and liminal state as a state of exception, see Dalakoglou, 2011. 3. Warmest thanks to Demi Kazasi for sharing this idea. We already knew when discussing it that it was too good to be true! The neighbourhood was named after Exarchos, a prominent local merchant who worked there at the end of the 19th century. 4. For a detailed description of the inherent spatiality of contemporary Greek politics see Kalianos, unpublished PhD Thesis,University of St Andrews,UK. 6. A record €110 bn at the time, soon to be bloated to approx twice the amount.